Located near historic Savannah, this barrier island has both salt and fresh water due to estuaries and marshes that flow through the area. The park borders Skidaway Narrows, a part of the intracoastal waterway, and provides scenic camping and picnicking. Nature trails wind through marshes, live oaks, cabbage-palmettos, and longleaf pines, allowing visitors to watch for deer, raccoon, shore birds, and colorful migrating birds such as the Painted Bunting. An observation tower provides another chance for visitors to search for wildlife on this beautiful island. A birding station, nature exhibits, and reptile room are featured in the park's nature center. Children will especially enjoy seeing the towering, 20-foot Giant Ground Sloth replica. Most facilities are ADA accessible. Our interpretive center is open Wed-Sun from 10 a.m. - 5 p.m. We also have educational programs daily. For camping reservations, call 1-800-864-7275. 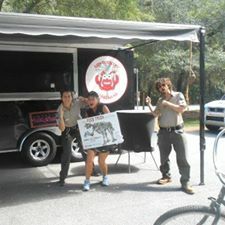 For the park office, call 912-598-2300. '¢ Host a 5K Race at this park!